There is a common misconception of what “poor posture” means, and because of this, there is a lot of bad advice circulating about how to improve bad posture. First, posture is not a physcial appearance or position, but rather a motor strategy adopted by the brain to hold the body in a certain position. 'How' and 'why' the brain picks the alignment we call posture is an expression of our physical and emotional state of well being. Also, our brain will always default to the most familiar position when we aren’t consciously thinking about alignment, so in the course of an 8hr day, we need a different approach to offset the over stressed tissues other than saying, "Sit up straight". There are 3 things I’d suggest thinking about when it comes to fighting "bad posture". Movement Snacks: Do at work – Certain tissues take more stress than others. To make the best of that inevitability, schedule in movement snacks that may take 30 seconds of your time every 30 minutes. Body Maintenance: Do at home – You will never fix posture by “thinking about it”. A well planned body maintenance routine will allow you to consistently work on your areas of weakness which may require more mobility and/or stability. By working on these areas consistently enough, the brain will begin to rely on more tissue variety to help support the body all day, which disperses the stress to the tissues creating less pain. Strengthen: Done as Exercise – Getting the Hips, Core, and Shoulders coordinated and strong will allow them to work together and make you harder to hurt! Strong tissues can withstand more stress, plain and simple, so by strengthening these areas they will become less sensitive. Movement Snack: 15 Anterior Pelvic Tilts. When sitting, don’t think about what to do with shoulders or head. If you simply work on setting the pelvis correctly, the other areas of the body will fall into place. Go from position one to position two slowly, holding position two for one full breath. Body Maintenance: Learn what a neutral spine feels like by performing the deadbug exercise. By learning what a neutral spine and proper breathing feels like, your body will crave that position and put you there without you thinking about it. Strengthen – Perform Exercises such as the Goblet Squats or Deadlifts. When we sit to much our body loses the ability to use the strong gluteal muscles, and as a result our hip joints suffer. 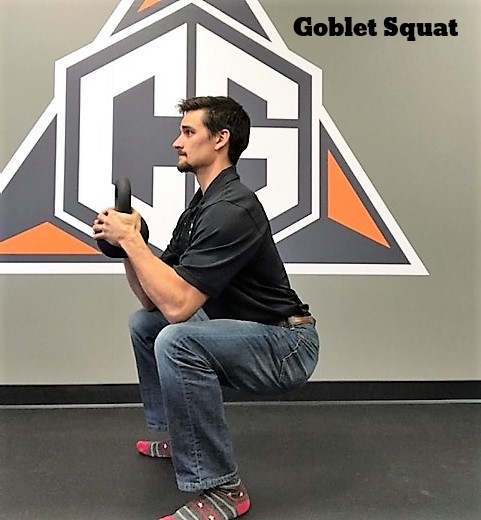 By strengthening different squatting and hinging movements you will decrease your risk of hip impingement or degeneration that is common in people who sit often. 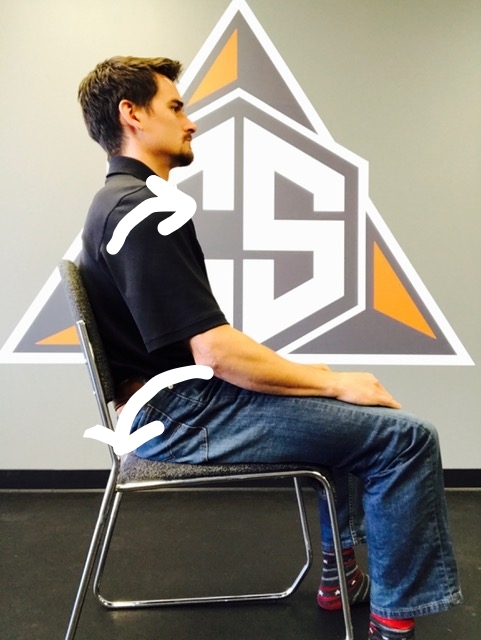 As you can see, there is more to “fixing Posture” than simply thinking about sitting up straight. You must change your brain’s autopilot if you wish to change your posture, and doing so takes some effort, but after a while you will no longer feel the “normal aches and pains” which come with adopting an alignment which stresses the neck and low back.